Far too often nowadays, my winter evenings I can wear short sleeve shirts rather than bulky coats and gloves. And, energy is no longer a question simply of money. I’ve reached the point of feeling like a Scrooge; feeling outrage over the tons of C02 going into the atmosphere via neighbors’ 10,000 light displays rather than feeling ‘joyous’. But, a compromise does exist; a path to cut sharply those CO2 emissions while still putting out those lights: LED lights. But, far too many are unwilling to spend the money upfront to cut their electricial use, reduce their pollution, and — actually — save quite a lot of money. Within the home … My household is dominated by Compact Flourescent Lightbulbs (CFLs) (see Making Energy CENTS — From the Home to the Globe ) and light-emitting diodes (LEDs) in recessed lighting (excellent light and dims well, unlike CFLs). When going to dine at a friend’s house, in one hand is the bottle of wine and the other carries CFL bulbs (delivered/wrapped in reuseable gift/shopping bags ). The Holiday season brings me to extend this into the domain of decorative lighting — of replacing incandescents with LED Christmas lights. In the hardware store a couple years ago, I was pleased to see real options for LED lighting; even if there were 20 times as many incandescents as LEDs. While stopping to admire the LEDs, I convinced two people to pony the upfront investment in LED Christmas lights. Those four boxes (what a signal achievement) were overwhelmed by the flow of traditional bulbs. The woman who had to buy 40 boxes for her new McMansion simply said that she couldn’t afford the LEDs. Calculating the cost Hmmm — let us work the numbers and understand what is going on here. 100 old-style incandescents at 5 watts each = 500 watts 12 hours / day for 30 days: = 360 hours One month of lights on all night: 180 kilowatts 180 kwh @ 8 cents kwh = $16.40 That is the traditional incandescent option, let us try this with LEDs. We can look to mini-bulbs, which use roughly a tenth of that, or .5 watts each. Thus, that 360 hours of 100 lights would run $1.64. And, then, there are LEDs, which cut the power required by another 90 percent: 100 LEDs at .05 watts each = 5 watts … (based on this LED lighting ). Going through the same calculation … 1.8 kwh @ 8 cents kwh = $0.14 (actually, 14.4 cents) At 8 cents per kilowatt hour (below the average domestic price in the United States), the incandescents cost $16.24 more per year to operate. Traditional incandescents cost: $3.99/string (before tax) LEDs: $17.99/string (price at an overpriced hardware store … easy to find online/elsewhere for under $15 and, with a little effort, under $10) At $16.24 less per string per year of electricity, the LEDs would be paid off in less than one season’s lighting and keep on saving for years to come. And, if one is going to be putting on lights, traditional incandescents would put out roughly 250-300 pounds of CO2 in that month versus the roughly two pounds from LEDs. And, of course, all these calculations are just for one string of lights. The woman buying her 40 strings – that is $600 or more in additional electricity per year. And, perhaps 10,000+ pounds of additional carbon dioxide. Just, of course, for that one McMansion. Around the community, 2500 light displays are not unusual and there are a few that must have 10,000s of lights. And, there are the public displays, including parks with miles of Christmas light displays. Just how much electicity is being burned and how much carbon going into the air to support these displays? 3. What we use the power for. Starting with the last, what we use the power for (the desired usage), the objective here is to have Christmas lights, no? To have ‘beautiful displays’, no? Fine, but do they need to be on 24/7? Or even 12 hours a day? Cutting that display to some key hours already does a lion’s share of reducing the lighting display’s carbon footprint. Moving back to the second, efficiency, the traditional path is using incandescents, which are not long-lasting, can cause fires, and use a large amount of electricity — especially when compared to the now widely available LED option. One can use a small fraction of the power and achieve not just the same, but better (safer, easier to string, longer-lasting (will to grandchildren)) results. Finally, let’s turn to the power source. Roughly, a bit less than 50% of US electricity comes from coal . Do we really want West Virginia mountaintops being razed for Christmas light displays? Is that desecration what the holiday is about? Rational people don’t call for people to live in the dark. They do, however, call on people to use CFLs, as much as possible, as a path to reducing electrical demand. Dominic Luberto comes close to defining excess when it comes to lighting . Having spent over $10,000 on lights, he typically had over 250,000 lights up. Estimated electric bill of $2000 per month (although, to be honest, this sounds like an embarassed understatement of actual costs). But, he hoped to cut into those costs . Now, he wasn’t planning to go with energy efficient, with LED lights. But, does efficiency address excess? Excess comes in many ways, from executives abusing the shareholders trust to eating far too heavily at a holiday table. We can shop excessively (credit-carding ourselves to debt) as individuals or a society. With some excess, we hurt no one but ourselves; other excess, such as executives receiving (not earning) pay packages 100s of times the average worker’s compensation, comes egregiously at the expense of others. Some excess, perhaps the executives, comes with a delusional concept that what we are doing is for the greater good. Sometimes that is true … dependent on how that “good” is defined. And, excess often occurs with a focus on the present over any thought toward the future. How do we rate Dominic’s excess? “Much-reviled”? In other words, NStar get your act together and help subsidize this energy profligacy. In fact, they already had, as they had to install additional electrical equipment to support his light displays . Every year, the lighting went on earlier (now Halloween) and stayed on longer (through the end of January). Mr. Luberto says he does it “for the kids.” He believes that the tradition of Christmas lights is dying and he’s out to revive it single-handedly. “They love it” he insists. Not all his neighbors do, however. They complain of not being able to sleep for all the super-bright light pouring in their windows; they complain of not being able to get into or out of their driveways due to the crush of traffic up and down their street all night, they complain that the display is just plain vulgar. Dominic Luberto is not to be disheartened. His goal is to have a house that can really be seen — from space. The traffic, of course, is an additive pollution cost encouraged, of course, by all the press. The Boston Globe‘s article: The Shining: It’s worth a trip, the light fantastic . Every evening, families pour out of SUVs and minivans to get a dose of the wonder of it all. The cars, sometimes by the score, pull over to the side of the road, their emergency blinkers on. DOMINIC LUBERTO: I don’t go half way, I go all the way or I don’t do it at all, and that’s the way people should do it, if you’re going to do something just do it right, go all the way and do it right. At the risk of being labeled a Grinch or Scrooge himself, given the urgency of our climate change situation, perhaps it is time to seek moderation and find new ways (or old — candlelight perhaps) to celebrate this magical time of year. Or perhaps people can choose to offset the increased usage through alternative energies or carbon credits. After all, and it seems Luberto has pre-empted me on this one, “it’s all for the kids,” and what world we leave for them and their children. For a good collection of Luberto stories, see Universal Hub . 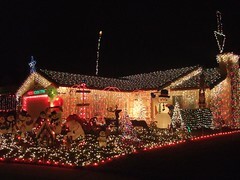 See Ecomorons for a contest as to the worst Christmas light excesses (and their post on Luberto ). Make sure not to miss this on Dominic Luberto . As I walk my overly warm neighborhood, with many homes lit up with 1000s of lights starting to appear and staying on all night, holiday lighting excess is on my mind as per Christmas Lights: melting away a White Christmas . Sadly, Dominic is not alone in his excess. Celebrate holidays without desecrating the earth … A simple question to ask: How much pollution is a string of lights worth? We will be in a far better situation when people celebrate through taking a deep breath of fresh air rather than adding those tons of C02 with 24/7 light pollution. If you love Christmas lights, it is time to get rid of those incandescents and replace them with LEDs. They are available on online and in an ever growing number of stores. By the way, there are even more benefits to LEDs as, due to the lower power requirements, the LEDs can have MUCH longer strings (easily 10x the bulbs in one string), are FAR less likely to cause fires, are nearly indestructable , and last FAR longer (probably would be working 50 years from now). Thus, again, if you love Christmas light displays, buy yourself a gift and replace your incandescent strings with LEDs. Your pocketbook will thank you. Earth will thank you. As, for me, a true tipping point in the social element of the battle against Global Warming will be when I don’t feel like Scrooge and we start pulling the plugs on non-LED lights. And … some notes See Making Energy CENTS from the Home to the Globe for a discussion of how I discovered that my CFLs were providing me a 200% Return on Investment (ROI) every year, year in and year out. Considering how my 401k has been transformed into a 301k and then a 201k, that ROI is pretty good. So, over the Thanksgiving weekend in the DC area, people were out Sunday putting up Christmas light strings … wearing shorts & t-shirts in 70 degree weather seemingly oblivious that their annual engagement in the rite of lightening the sky might have, cumulatively, anything to do with the chaotic weather conditions. This sparked what has now become an annual rite of posting about LED Christmas lights. I really like your holistic approach to lighting and enjoyed your post. I’m a fan of LED lights. They use 80-90% less energy than traditional lights, are more than twice as energy efficent as CFLs, don’t contain mercury, and are cool to the touch – so safer for children and pets. 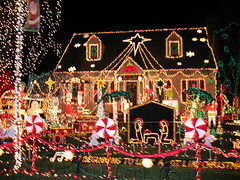 Using LEDs is a great way to be in the Christmas spirit and save electricity. Another way is to put the lights on a timer and shut them off at 11:00 pm. That way they are only on for a few hours a day and not all night. Much cheaper upfront costs than converting to LEDs. LEDS are definitely the way to go long term. Very good article! I vote LEDS every time. Using LED is smart, however do not stop there, the power source for LED can come from solar energy. A small solar panel can run Led lights through the night even in the winter. all your outside lighting should come from solar LEDs. The lights come in different lengths and colors with a neat panel and push in the ground stand. Save the planet, money and have a happy Christmas. I’ve taken the strategy of phasing in LEDs as the old ones break (so as not to trash the old ones that still work), but now I wonder if switching to LEDs wholesale might actually be less costly (earthwise and dollarwise) even considering the added trash. Then again, the old cheap ones I have don’t take so long to break and need replacement anyway! LED Christmas Lights Use Less Energy. LED Lights Are Definitely Safer and More Durable. LEDs Last Longer than Traditional Holiday Lights. LEDs are Inexpensive, Bright, Beautiful and Economical for Home Use. Give the planet a gift by choosing LED Christmas lights that are eco friendly and use very little electricity. They are also bright, glowing and a pleasure to use. Nice article and a very sensible comparisisob between CFL sand LED. I vote for LED. It is really great.